Surprised no u18's from Gonzaga made Ireland u18 squads, Jack Barry and Hugo Fitzgerald would have been strong candidates. Could be injury related of course. * = 2nd year at this level. Last edited by mildlyinterested on April 16th, 2019, 10:57 am, edited 1 time in total. Good distribution among Leinster Clubs of those trophies. Hard luck to Gorey. Last edited by mildlyinterested on April 16th, 2019, 10:39 am, edited 1 time in total. Fish & Gilsenan are both U19 and both injured. Guinane is a puzzle. Might also be injured. I think he will develop well. Has a great rugby brain and can play 4, 5 & 6. Also has a good frame to fill out. Fish and Gilsenan are u18 for the remainder of this season. Guinane was involved in warm up games, so maybe just didn't make the squads. 14. Andrew Smith (St. Michael’s College) - in Ireland u19 squad, starting 15 for St. Michaels. 13. Karl Martin (St. Mary’s School, Drogheda) - in Ireland u18 squad, Boyne RFC. Eligible for u18 again next season. 18. Charlie Ward (Tullow Community School) - injured. Club: Clontarf. 19. Sean O’Brien (Blackrock College) - in ireland u19 squad, starting 6 for Blackrock. 21. Cian Prendergast (Newbridge College) - playing for UCD. Involved with Ireland u19 earlier in season. 23. Ben Murphy (Presentation College Bray) - in ireland u18 squad, starting 9 for Pres Bray. 26. Chris Cosgrave (St. Michael’s College) - in ireland u18 squad, starting 13 for St. Michaels. 9. Shane Murphy (Skerries) - Club: UCD, Cara Cup. 8. Ed Brennan (Blackrock College) - starting 8 for Blackrock, wider u19 squad. 16. Mark Nicholson (Wicklow) - still in school, playing backrow for club. A last-minute try from Mark Hernan, St. Michael’s Leinster Schools Senior Cup-winning captain, sealed the result for Tom Tierney’s side. They recovered from 10-0 and 17-7 deficits with Old Wesley prop Harry Noonan and Ulster prospect Aaron Sexton both touching down, while Bandon Grammar School skipper Jack Crowley landed all three conversions. It was a difficult assignment for the Ireland U-19s given their only outing of the season was back in December against Australia, whereas the France U-20 Development had already played eight games, including seven internationals. The French had defeated England (41-21), South Africa (28-21), Wales (52-7), Italy (40-10), Georgia twice, and also Scotland (66-5) just last week. As expected, the hosts started the game strongly and controlled a good percentage of the possession and territory in the opening exchanges. Ireland defended heroically but there was little they could do to prevent a pacy seventh-minute break ending in a try for back rower Thibaut Hamonou, who has signed his first professional contract with Toulouse. Openside Hernan spent time in the sin-bin as Ireland came under further pressure, leaking a second unconverted try to Grégoire Bazin in the 17th minute. With captain John McKee and fellow U-20 Grand Slam winners David McCann and Brian Deeny showing the way, Tierney’s charges started to come more and more into the game. A series of attacks saw them take control of play and pressurise France via lineouts within try-scoring range. The home defence could not hold out, and just before half-time, loosehead Noonan was driven over from a well-executed maul. Crowley added the extras to cut the gap to 10-7 at the interval. Both teams resumed in the second half in a very positive manner, attacking with ball in hand at every opportunity. Both defences maintained their shape and were unwilling to give up points. That was until the final quarter when the fitness, skill, attitude, organisation and determination of the Ireland team shone through. Despite giving away a penalty try due to a collapsed maul in the 63rd minute, Ireland responded immediately with a flurry of attacks which saw Bangor speedster Sexton finish off a well-taken try, converted by Crowley. The score set up a grandstand finish with the 700 spectators gripped by the end-to-end action. The visitors stuck to their strengths and attacked from both scrums and lineouts close to the French line. With just seconds remaining, they built through the phases before Hernan managed to find a sliver of space and touch down from close range. Crowley nailed his third successful kick to make it a four-point winning margin. 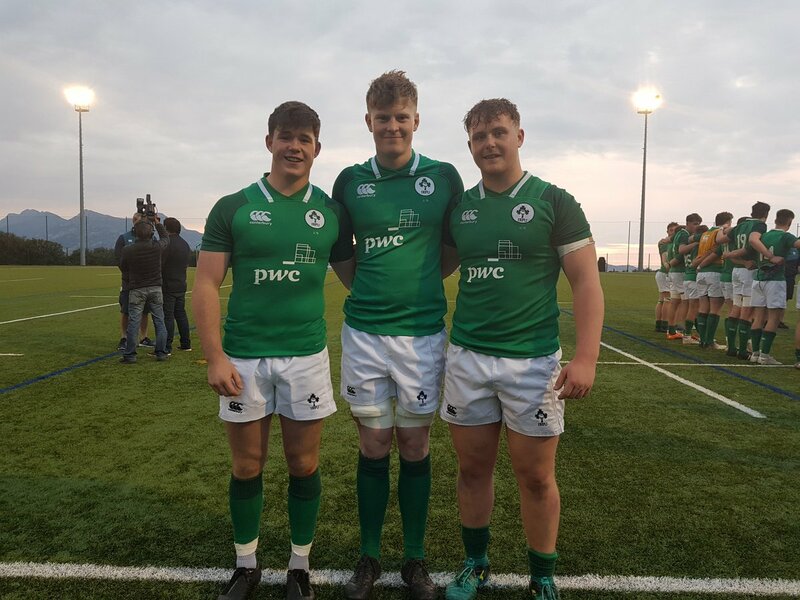 In winning on French soil, Tierney’s class of 2019 followed in the footsteps of the Ireland U-19 team of 2015 which defeated France 13-10 at Marcoussis during the annual two-match series. Current senior internationals Jacob Stockdale and Andrew Porter were part of that squad, four years ago. McKee and his team-mates will have an opportunity to complete a 2-0 series win at Stade Armand-Cesari in Bastia, Corsica on Easter Saturday (kick-off 8pm local time/7pm Irish time). IRELAND U-19: Oran McNulty (Galwegians/Connacht); Ethan McIlroy (Methodist College Belfast/Ulster), Luis Faria (Dublin University/Leinster), Mick O’Gara (Presentation College Bray/Leinster), Aaron Sexton (Bangor Grammar School/Ulster); Jack Crowley (Bandon Grammar School/Munster), Lewis Finlay (Ballynahinch/Ulster); Harry Noonan (Old Wesley/Leinster), John McKee (Old Belvedere/Leinster) (capt), Liam Winnett (Buccaneers/Connacht), Brian Deeny (Clontarf/Leinster), Thomas Ahern (Shannon/Munster), Ciaran Booth (Sale Sharks/IQ Rugby), Mark Hernan (St. Michael’s College/Leinster), David McCann (Banbridge/Ulster). Replacements used: Ben Power (Queen’s University/Ulster) for O’Gara(12) (47 mins), Anthony Ryan (Dublin University/Leinster) for Booth(6), Scott Buckley (CBC Cork/Munster) for McKee(2), Eoin O’Connor (Waterpark/Munster) for Ahern(5) (all 56), Andrew Smith (St. Michael’s College/Leinster) for McIlroy(14) (60), Fionn Finlay (St. Michael’s College/Leinster) for Winnett(3) (68). Last edited by mildlyinterested on April 17th, 2019, 10:02 am, edited 1 time in total. ireland u18 schools lost 17-24.
from a leinster POV, Barron, Soroka, Boyle, Hickey & Cosgrave impressed in the time they got. Murphy was mixed off the bench and Osbourne was good but quiet on the wing. All bar Gilsenan,who could be i don't know, are injured to varying degrees, one was injured in a trial match for the Ireland squads.